The Mojito has captured the collective American imagination and sparked a boom in bars and lounges around the country. While the drink originated in Cuba in the early part of the 20th century, it became an international hit during the ‘30s and ‘40s. The country was flourishing, and Havana was a playground for the rich and famous. The place to be seen was the La Bodeguita del Medio bar, the birthplace of the Mojito. The refreshing Mojito is made in a Collins, bucket or specialty glass. 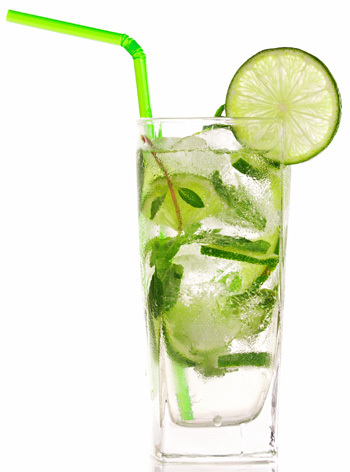 Place simple syrup, fresh lime wedges and a generous portion of mint leaves (5 to 6) in the glass. Muddle the ingredients, add some ice as well as 2 to 3 ounces of light rum and a splash of club soda for effervescence. The final touch is a garnish of fresh mint sprigs. In addition to being delicious and thirst quenching, the Mojito has a number of compelling attributes. The muddled combination of mint leaves, sugar and lime wedges makes for an interesting appearance. Then there’s the drink’s enhanced production value. Correctly preparing a Mojito takes some time and effort, the theatrics of which is an added benefit. Finally, the drink is versatile, accommodating a wide range of flavors. The Mojito bears striking family resemblance to several traditional Brazilian concoctions, the best known of which is the Caipirinha. It is a marvelous drink served in a bucket or tumbler that’s made with simple syrup and a quartered lime, both of which are strenuously muddled. The driving force behind this cocktail is cachaça, a clear Brazilian spirit produced from sugar cane. Use between 2 to 3 ounces of cachaça, add ice and garnish with a fresh lime wedge. Two other Brazilian-borne cocktails are the Caipirissma and Caipiroshka. The Caipirissma is prepared in the same manner as the Caipirinha, only light rum is substituted for the cachaça, while the Caipiroshka showcases the services of vodka instead of cachaça. All three South American cocktails are delicious and distinctive. They differ from the Cuban Mojito in the type of spirits used and none are prepared with muddled mint leaves. • The muddled base. One of the great things about a Mojito is watching its preparation. Beyond its theatrical appeal, the muddling process is essential to achieving the cocktail’s depth of flavor. It’s arguable that the Mojito’s true character can’t be reproduced in any other manner. Certainly hand-shaking the ingredients won’t achieve the desired effect. The secret lies in the muddling action involving the mint leaves and pieces of lime. The objective is two-fold. First, you want to gently crush the mint leaves with the flat of the muddler so the essential oils are released but the leaves remain somewhat intact. A mangled heap of leaves in a glass is not appealing. The mint leaves should be removed from the sprig before being placed in the glass; the stems are too bitter. Without the muddled fresh mint, the Mojito fails to live up to its advanced billing. The mint is present in nearly every aspect of the cocktail. The predominant variety of mint selected for use in Mojitos is spearmint, although some prefer peppermint, pineapple mint and the yerba buena variety from Central and South America. The object behind muddling the lime wedges is to express the fresh juice while not overly bruising the fruit’s bitter white pith. Some of that bitterness is actually a welcomed thing, but too much and the drink will be adversely affected. Regarding which type of sweetener to use in a Mojito, granulated white sugar is a frequent choice, but to be most effective the sugar must be thoroughly dissolved. Simple syrup is particularly advantageous for that reason. Creative options include sweetening the drink with guarapo (fresh sugar cane juice) or brown, raw or powdered sugar. • Spirit options. The traditional spirit base in a Mojito is light rum; the better the rum, the better the Mojito. The good news is that there are a great many brands of premium light rum from which to choose. In the pursuit to make a world-class Mojito, strongly consider experimenting with the famed rhum agricoles, such as Rhum Clément from Martinique, Trinidadian 10 Cane Rhum or Rhum Barbancourt from Haiti. Their vibrant, flavor-imbued characters are incomparable when featured in Mojitos. Dark rums are also marvelous in the drink; they add color and waves of dry, often spicy flavors. Yet, if working with different flavors is high on your list, then showcasing a flavored rum or vodka in the drink is just the ticket. Between the two categories, there’s a stellar brand representative of every popular flavor. Imagine the possibilities. You might decide to muddle together Cruzan Raspberry Rum with a handful of fresh raspberries, mint leaves, limes and sugar, or Stoli Blueberi Vodka and a tablespoon of blueberries. Then again you could muddle together a mango-flavored rum with muddled papaya, limes, mint and sugar. Using the spirit as either a flavor enhancer or as a counterpoint is part of the artistry. The Mojito is a superb delivery system for most light spirits. Silver tequila is great a choice. Its exuberant character works well with the muddled mint and sweetened lime juice in a Mojito. Not surprisingly, so does gin. As Bafferts Mint Flavored Gin has proven, mint is a natural complement to the aromatics used in gin. Infusions and exotic products — e.g., aguardiente, cachaça, sochu, sake — are also viable choices. • Groovy modifiers. As alluded to previously, fruit, syrups and juice often are relied upon as modifiers in Mojitos. For example, a specialty at Philadelphia’s Cuba Libre Restaurant is the Sandito Mojito. It’s made with white rum, yerba buena mint leaves, guarapa (cane juice) and freshly squeezed watermelon juice. A partial list of modifier choices includes pomegranates, mango puree or nectar, passion fruit, pineapples, grapefruit or kiwi slices, blood oranges, kumquats, blackberries and prickly pear juice. Whatever you can’t find at the produce market might be available on your backbar. Liqueurs such as PAMA, Malibu, Chambord, ZEN, Rhum Clément Creole Shrub and Grand Marnier seemingly were created with a flavor-starved Mojito in mind. • Finishing school. The final ingredient in the Mojito is a splash of club soda, which adds a welcomed blast of effervescence. But even here you have creative latitude. There’s no reason to limit yourself to using plain carbonated water when the world’s finest sparkling waters are available for service. Then again, why not consider charging a Mojito with Champagne or ginger beer? They’ll add flavor as well as effervescence. • Exit strategies. Classic Mojito garnishes are mint sprigs and either a lime wheel or wedge. The wedge should be used if you want to provide your guests with an opportunity to squeeze more juice into the drink. If not, the less functional, but more attractive lime wheel might be a better choice. Many bars are adding a segment of sugar cane to their Mojitos. It looks great and performs admirably as a swizzle.